A new report has revealed astounding estimates of the global illegal drug trade’s scale, and has detailed a variety of new trafficking trends. On March 27, Global Financial Integrity (GFI) published a report - Transnational Crime and the Developing World - which evaluates the extent of, and trends within, transnational crime. According to the document, the global market in drug trafficking has an estimated annual global value of between $426 billion and $652 billion (USD), making it the second most lucrative illicit market measured after that of counterfeit and pirated goods, which is estimated to generate as much as $1.13 trillion annually. 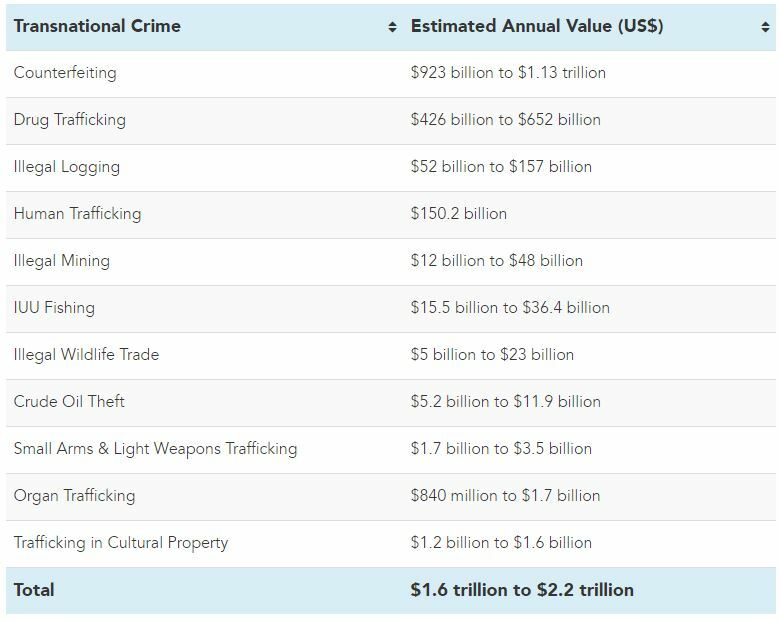 GFI, a US-based non-profit research organisation which focuses on illicit financial flows, used quantitative data from a range of sources - including NGOs, governments, and law enforcement bodies - to produce value estimates of 11 major illegal markets. The report's authors warn that there is an inherent lack of accuracy in estimating the value of illegal markets, as the "operations and transactions are covert". The true value of the global drug market is, therefore, impossible to accurately calculate while the trade remains illegal. In addition, there are considerable variations in how different countries define and measure drug trafficking and its value, thus leading to inevitable inconsistencies when attempting to gauge an estimate of the annual global value of the trade. However, rather than overestimating the value of the market, the report’s authors speculate that they may have underestimated it, as it is possible - perhaps even likely - that there is more drugs being trafficked than many governments realise. Additionally, GFI's estimation only considers the markets of cannabis, cocaine, opiates, and "amphetamine-type stimulants" (ATS); it does not take in account the value of other drugs, including many new psychoactive substances (NPS). NPS, such as synthetic cannabinoids, are often designed to mimic the effects of other illegal drugs. The report describes how the production and trafficking of ATS and NPS are thriving in regions with "porous borders and/or weak controls on precursor chemicals". It points to a growing trend of methamphetamine being produced in Latin America, using chemicals acquired through legal Chinese channels for illegal purposes, targeted at US buyers; a perfect example of the international interconnectedness of the drug trade. As TalkingDrugs reported in January, the production of methamphetamine is also surging in Iraq for similar reasons. The instability caused by the Syrian Civil War and conflict with ISIS has weakened the country’s borders, as well as authorities’ ability to control the domestic trade of chemicals. A source at the Iraqi National Security Agency warned last year that "criminal gangs [are] transforming Iraq from a transit country to a [producer] country". Despite this, the global ATS market is estimated to be the smallest drug market of the four types researched. According to GFI’s report, the global market in cocaine is valued at between $94 billion and $143 billion, an increase from an estimated $88 billion in 2008. This makes the cocaine market the second largest drug market after that of cannabis (valued at between $183 billion and $287 billion). Colombia and Peru have alternated as the top cocaine producer country over past decades due to "internal distributions to cultivation and production in one country", the reports claims. This concept is known as the "balloon effect", whereby law enforcement pressure on drug crime in one area pushes it into another (“squeezing a balloon in one place makes it expand in another”). As of 2016, Colombia was the number one global producer of coca, the plant from which cocaine is produced. However, following increasingly repressive counter-narcotic tactics from the Colombian government Peru may reclaim the notorious top spot. As TalkingDrugs reported in 2016, the Colombian state has resumed the use of a potentially carcinogenic herbicide in an attempt to curb coca production. The report emphasises that the greatest harms of the global drug trade fall upon developing countries, particularly those which are in politically fragile circumstances. In these countries, drug trafficking groups’ use of violence can compel governments to “spend greater resources on law enforcement in order to address these attacks on domestic stability, directing funding away from sustainable development”. This conflict between drug trafficking groups and the government in developing countries can be a self-perpetuating cycle that increases poverty, weakens the state, and resultantly may empower trafficking groups. For example, as the United Nations describes, the illicit cultivation of drugs, including opium and coca, is "linked to rural poverty" – so if a state’s diversion of resources from development to law enforcement increases poverty, it may also be inadvertently increasing the number of people who enter illegal drug production. The value of the global drug trade has become so large that it far surpasses the gross domestic product of many countries. GFI proposes several policy recommendations relating to increased financial scrutiny by which governments may combat the drug trade in their jurisdiction, however, the inherent link between trafficking and political corruption, as well as the aforementioned “balloon effect”, suggests that more substantial change will be needed to counter trafficking.